For those of you who thought Karl Lagerfeld's namesake "K" sneakers looked a lot like the kicks New Balance has been putting out since forever, you're not alone. The athletic shoe company also thinks Lagerfeld's kicks are a little too similar to its own designs. TMZ has obtained a lawsuit New Balance has against Lagerfeld, claiming that his sneakers, though emblazoned with a "K" and not an "N" will cause brand confusion since they are so similar. New Balance even noted that fashion bloggers are noticing the similarities, citing a post from SheFinds.com titled, "Wait, Did Karl Lagerfeld Just Knock Off New Balance Sneakers?" They argue that they've been making that style of shoe since the 70s, and although Lagerfeld's version will cost you about $360, surely he must have realized that he was creating a knockoff of the $105 shoe. 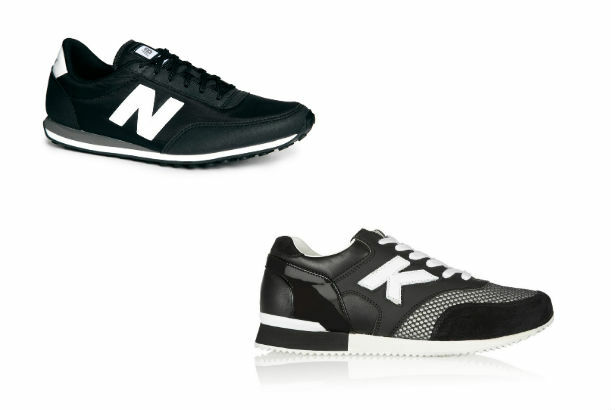 Uncle Karl's "K" trainers are definitely almost identical to the classic New Balance sneakers, so much so, that I can't help but wonder if the twin-like similarities were intentional. Designer parodies are definitely trending in fashion (just ask Brian Lichtenberg) so perhaps Karl's shoe was a high-end version of the trend. Either way, he's going to have to answer to the judge on this one.